Awesome biceps peaks don't come without really tough training. Follow Kizzito Ejam's workout to build size, strength, and shape in your arms. Afterward, you won't be able to look in a mirror without flexing! I've been asked more than a few times about how I've put on so much size in the past few years. In particular, my arms and abs have gotten bigger, stronger, and better shaped. I'll let you in on a secret: it took hard work in the gym and great nutrition. Want more detail? 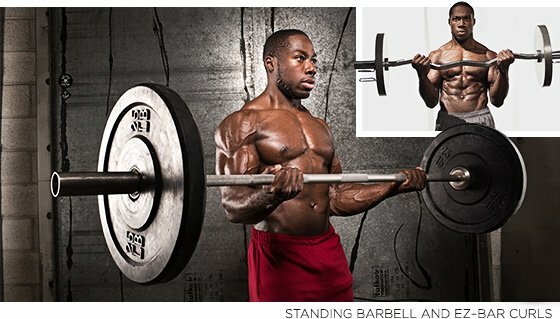 Here's the workout I've used to add shape and size to my biceps and triceps. I've also included an abdominal circuit so you can work on carving that 6-pack! This workout isn't easy. You're going to feel some pain. But you can't focus on the pain. Focus on your vision, your goal, your purpose—that will get you through anything. Keep your mind on the results and the energy will come. If you're ready, let's get it done! Do a couple lighter sets for a warm-up before you begin the workout. Kill the muscles. Four sets total, 45-seconds rest in between. The short rest is crucial. You'll keep a great pump and build muscles. After the first superset, you should barely be able to pick up a water bottle. Get used to that fatigue—the workout doesn't get easier. Bodyweight skull crusher looks like a push-up, except your hands are closer together and placed farther out from your body. Bring your head to your thumbs, and then push upward. Always take your body to failure; failure is your friend. Spider curls focus on the peak of the biceps—they'll give you that ball look. While doing bench dips, I like to put my feet on the dumbbell I was just using. It makes the exercise a little more difficult. Don't rest between exercises. It's a tough giant set, but it's the last thing you'll do for your arms today. Get through it. I chose these three exercises to hit the upper abs, lower abs, and the obliques. Weighted lifts really help to build those muscle bellies. That's how you get those deep grooves and that 3D effect.